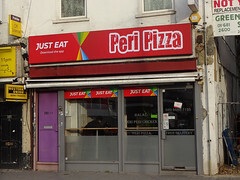 Pizza and grilled fish/chicken place on London Road. There is some eat-in space, but they're mainly a takeaway. They also do delivery, and offer online ordering via Just-Eat. Accessibility: A step to get in. Last edited 2019-02-16 17:33:05 (version 26; diff). List all versions. Page last edited 2019-02-16 17:33:05 (version 26).